California State Senator Scott Wiener just introduced the bill I’ve probably been waiting for since I started following land use and transit in California over a decade-and-a-half ago. SB 827 would dramatically scale back local government restrictions on housing near major transit stops (see the fact sheet PDF). These restrictions by local governments have prevented new housing from being built in precisely the job- and transit-rich locations where we need housing the most. They’ve also prevented transit from performing well, in terms of greater ridership and reduced public subsidies, as light rail lines like Expo in Los Angeles serve neighborhoods that don’t allow anything but a single-family, detached home to be built. Overall, the effect on housing supply from these exclusionary zoning policies has caused severe environmental degradation in the state by encouraging more sprawl and traffic. And it’s caused an economic crisis of unaffordable homes and rents that has squeezed the middle class right out of the state and led to gentrification of low-income neighborhoods. SB 827 puts a bullseye on these policies. First, among other reforms, it would remove all density limits and parking requirements on any project within a half-mile of a major transit station, defined as anything from rail to a bus stop with at least 15 minute intervals during peak commute times. As if these changes aren’t enough, SB 827 would prevent local governments from imposing a height limit of less than 85 feet if the development is within one-quarter mile of a “high-quality transit corridor” or within one block of a major transit stop (with a few exceptions), and 55 feet if within a half-mile. California has a number of communities with strong access to transit, and we continue to invest in public transportation. 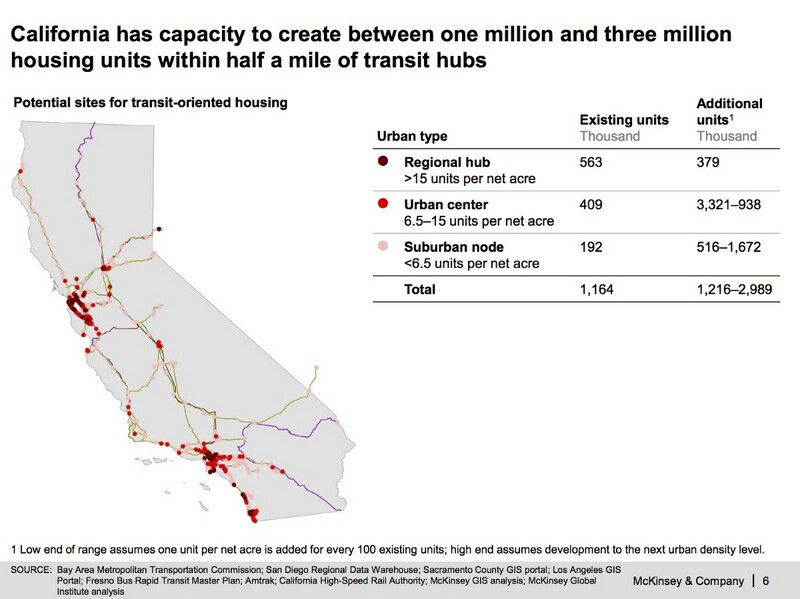 Too often, however, the areas around transit lines and stops are zoned at very low densities, even limiting housing to single family homes around major transit hubs like BART, Caltrain, Muni, and LA Metro stations. Mandating low-density housing around transit make no sense. Along these lines, our analysis at CLEE and UC Berkeley’s Terner Center in the 2017 report Right Type, Right Place found that California could achieve annual greenhouse gas reductions of 1.79 million metric tons if we built all new residential development within a few miles of major transit (not to mention additional savings if you factor in new commercial development in those areas plus reduced driving and pollution from existing residents there). California has attempted to address this environmental and economic challenge from the multi-decade long underproduction of housing legislatively over the past few years. But most of those bills have been largely ineffectual reforms to planning processes or way-too-limited streamlining that only adds up to a drop in the bucket. Meanwhile, even relatively robust efforts to subsidize affordable housing are miniscule compared to the scope of the problem. SB 827 is the first one that could truly be a game-changer for housing and the environment. To be sure, SB 827 faces an uphill battle to passage. Wealthy homeowners in single-family neighborhoods, along with their elected representative allies and lobbyists, will be out in full force to defeat this bill. They may even have help from advocates of subsidized affordable housing, who often rely on processes to relax these exclusionary local policies as a way to gain concessions to build more affordable units. As an indication of the political difficulty, the parking requirement relaxation provision was already attempted back in 2011 as a standalone bill and went down to defeat in the legislature at the hands of the League of California Cities. But on the upside, the politics in Sacramento around housing have changed in the past few years, as the scale of the problem has become more clear and as constituent groups like the “YIMBYs” have been organizing politically. That means that the bill may eventually survive to passage, albeit in a potentially stripped-down form. If it goes down to defeat, it will be interesting to see how much support it gets. Because this issue isn’t going away, and neither are pro-housing advocates. They’ll keep coming back until California starts to take steps to address decades of counter-productive land use policies. SB 827, as introduced, is the first truly significant step in that direction. Nice post. Thanks for reporting.